Johnnie Robert Wright, Jr. (May 13, 1914 – September 27, 2011), known by his stage name Johnnie Wright, was an American country music singer-songwriter, who spent much of his career working with Jack Anglin as the popular duo Johnnie & Jack, and was also the husband of country music star Kitty Wells. 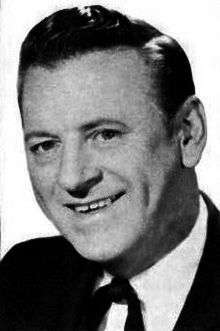 Born in Mount Juliet, Tennessee, Wright first performed with Anglin in 1936. In 1937, he married Kitty Wells. The two, along with Wright’s sister Louise, performed as Johnnie Wright & the Harmony Girls. In 1939, Wright and Anglin formed the duo Johnnie & Jack. They teamed up full-time in the 1940s and, except for the time Anglin spent overseas during World War II, remained together for more than two decades. In 1952, Johnnie & Jack’s "Poison Love" took them to the Grand Ole Opry, where the duo, along with Wells, were invited to join and where they remained for 15 years. Following Anglin's death in an automobile accident in 1963, Wright continued performing and releasing records. After his name was misspelled on a record label, Wright changed his name from Johnnie to Johnny. In 1964, he and his Tennessee Mountain Boys had a Top 25 hit with "Walkin', Talkin', Cryin', Barely Beatin' Broken Heart." The following year, he had success with "Hello Vietnam", a No. 1 hit. In 1968, he and Wells recorded an autobiographical duet, "We'll Stick Together", and continued playing live shows together through 2007. In 1983, Wright and Wells opened the Family Country Junction Museum and Studio in their hometown of Madison, Tennessee. They closed the museum in October 2000, but their grandson, John Sturdivant, Jr. kept the Junction Recording Studio operating. Wright joined producers Randall Franks and Alan Autry for the 1991 CD "Christmas Time's A Comin'" featuring the cast of the TV series In the Heat of the Night. He performed along with Kitty Wells and Bobby Wright on "Jingle Bells" with the cast. In 1992, the couple and their son Bobby began playing together again. On December 31, 2000, the duo performed their farewell concert at the Nashville Nightlife Theater in Nashville, Tennessee. They played to a full house of fans, family and friends that included Ricky Skaggs, The Whites, Marty Stuart, Connie Smith, Leona Williams, Larry Stephenson, Tommy Cash, Jack Greene, Jean Shepard and comedian-impressionist Johnny Counterfit. Kitty Wells and Johnnie Wright were married on October 30, 1937. Together they had three children, two daughters Ruby (1939–2009) and Carol Sue( June 12, 1941 (age 71)), as well as a son, Bobby. Each of their children enjoyed minor success individually as recording artists—Carol Sue, on a mid-1950s duet with Wells titled "How Far is Heaven"; Ruby, with a hit called "Dern 'Ya," an "answer song" to Roger Miller's "Dang Me"; and Bobby, with a series of country-pop hits in the early to mid-1970s, including "Seasons in the Sun" (covering Terry Jacks' No. 1 pop hit from 1974). Both Bobby and Ruby performed as part of their parents' road tour for many years. Johnnie Wright died at his home of natural causes in Madison, Tennessee on September 27, 2011, exactly two years after older daughter Ruby's death; and 33 days short of his 74th wedding anniversary with Wells. Wright had been in failing health for some time. He was survived by his wife of 73 years and their 2 surviving children Bobby and Carol Sue, plus 8 grandchildren, 12 great-grandchildren, and 3 great-great-grandchildren. Wright's widow Kitty Wells followed him in death less than ten months later on July 16, 2012. 1 2 3 "Johnnie Wright Obituary". Spring Hill Funeral Home and Cemetery. 27 September 2011. Retrieved 8 January 2013. ↑ "Queen of Country Music’s Daughter Passes Away," Pure Country Music, September 28, 2009. Retrieved 27-08-12. ↑ Whitburn, Joel (2008). Hot Country Songs 1944 to 2008. Record Research, Inc. p. 476. ISBN 0-89820-177-2. ↑ Cooper, Peter (27 September 2011). "Johnnie Wright, country star and husband of Kitty Wells, dies at 97". The Tennesseean. Retrieved 27 September 2011. ↑ "'Queen of Country Music' Kitty Wells Dies". WKRN-TV. 16 July 2012. ↑ "Kitty Wells Obituary". Austin & Bell Funeral Home. 16 July 2012. Retrieved 8 January 2013. Wikimedia Commons has media related to Johnnie Wright.